Garbage trucks to soon be parked on Mount Carmel Pl. 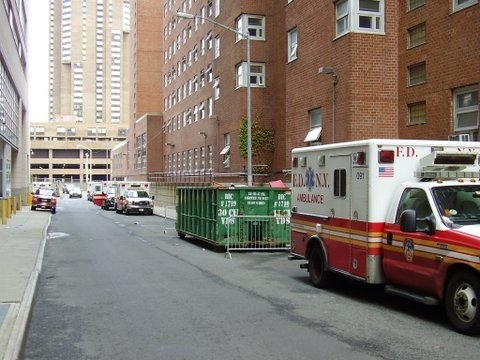 The Department of Sanitation has warned Kips Bay residents that the agency will be parking up to seven garbage trucks adjacent to Bellevue South Park starting next Monday. 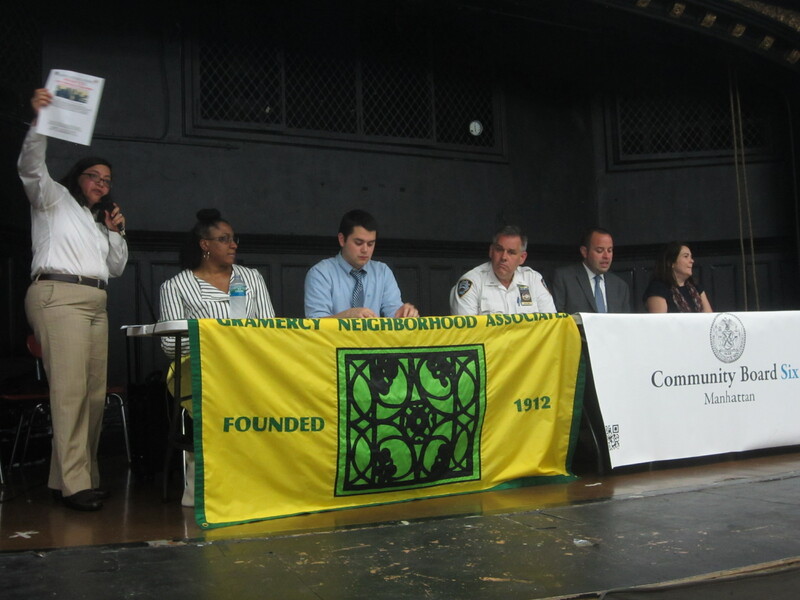 Representatives for the agency informed members of Community Board 6’s transportation committee about the trucks’ arrival at a meeting on Tuesday, saying that the change is necessary because DSNY will soon be evicted from the current sanitation garage at 606 West 30th Street. Between four and six trucks will be parked on Mount Carmel Place between East 26th and 27th Streets on the east side of the park. DSNY community affairs officer Iggy Terranova said that the trucks will leave their spots on Mount Carmel Place by 6 a.m. to pick up trash and return around 2 p.m. Residents and community board members at the meeting were worried about whether or not the trucks would be parked in the neighborhood with a full load, and Terranova said that the only time full trucks will park in those spaces is if workers don’t have time to dump them during the morning shift. If this happens, the trucks will then be taken out for the 4 p.m. to 12 a.m. shift and dumped then. Trucks will then be parked on Mount Carmel from midnight to 6 a.m. Almost 200 residents living in the area around the Brookdale Campus where a sanitation garage has been proposed expressed their frustration on Monday night when the Department of Sanitation and the Economic Development Corporation continued to move forward with the plans, hosting a public scoping hearing on the draft Environmental Impact Statement. While some of the aggravation stemmed from the lack of notice for the recent hearing, as well as the location on East 17th Street and Second Avenue, an inconvenient venue for the many Waterside Plaza residents who wanted to attend, many residents were primarily concerned that plans for the garage were going ahead with little consideration for the community’s objections. Terence O’Neal, who is chair of the Community Board 6 Land Use and Waterfront committee but who submitted his testimony at the hearing as an individual and not a representative of CB6, said he was frustrated that the draft EIS failed to mention any of the work the community board has done in looking at alternate sites and alternative solutions. Waterside’s owner and developer Richard Ravitch revealed on Tuesday that he would like to see the bookend parcel of the proposed sanitation garage on East 25th Street become housing for seniors. Ravitch discussed the issue at a meeting held by the Waterside Tenants Association, saying that some kind of affordable housing option would be the most compatible use of the Brookdale site for the community. “There’s no reason that the interests of the landlord should be different from those of the people at Waterside,” he said. Ravitch, who’s an octogenarian himself, said that he has been talking with nonprofit organizations to come up with a plan for some kind of development that would offer both housing and services for seniors, although nothing is solidified at the moment. He emphasized that what he would like to prevent is a tall commercial building on what is now the CUNY Brookdale site, and would prefer the addition of services for tenants at Waterside. He added that another one of his concerns, even more specific to Waterside Plaza residents, is the fate of the footbridge over the FDR Drive that connects the property to East 25th Street. He said that there is a possibility that the property is put to competitive bidding and if that happens, the possibility of making the bridge accessible seems even more uncertain. Community residents were surprised by the format of the most recent meeting on the proposed sanitation garage, held at the Brookdale Campus on East 25th Street last Thursday evening. The meeting, billed as an open house, went “exactly as anticipated,” Economic Development Corporation senior associate of public affairs Ian Fried told Town & Village, but the set-up was different from that of previous meetings on the subject and many residents at the most recent event felt that it wasn’t as constructive as meetings in the past. 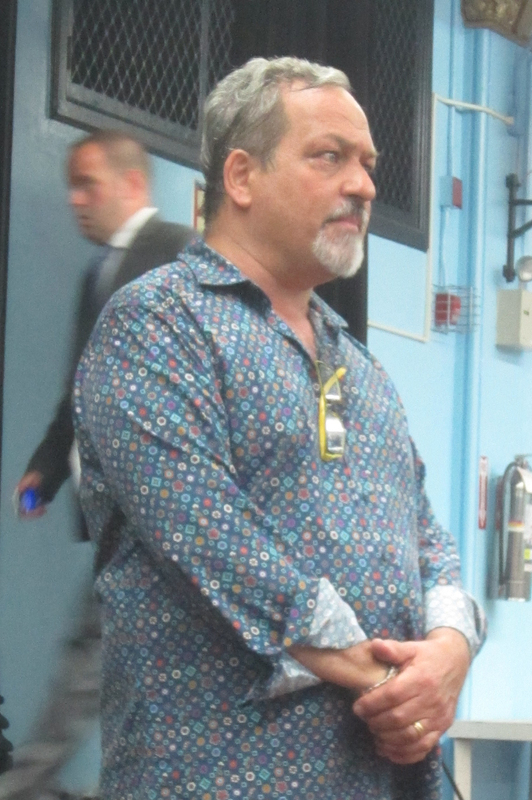 “What we were expecting was something more like what happened the last time it was in the auditorium,” ST-PCV Tenants Association chair Susan Steinberg said. “(The last meeting) was a back and forth discussion. We thought we’d be shown a slideshow and more details about the project. The meeting was held inside the Brookdale Campus, the location for which the sanitation garage is proposed. The second most recent meeting on the topic was a more boisterous affair, during which some meeting attendees took turns yelling harsh criticisms about the plan to the representatives of the two agencies who had given the presentations. Members of Community Board 6’s Land Use and Waterfront Committee recently learned of a new proposal concerning the garage that the Department of Sanitation wants to build on East 25th Street between First Avenue and the FDR; a plan that presents the possibility of building the facility near the Con Edison plant at East 15th Street and Avenue C.
This proposal came from BFJ Planning, a consulting firm that CB6 has hired to come up with other options for the Brookdale Campus, which will be vacated when Hunter College moves the current program uptown, as well as to come up with an alternative spot for the sanitation garage. BFJ Planning Senior Associate Jonathan Martin presented the preliminary proposal, which had been shown to the board’s steering committee for the sanitation garage last month, at the Land Use and Waterfront Committee’s monthly meeting last Wednesday. Martin focused on the rationale behind the alternative location for the facility. He acknowledged that DSNY’s plan is partially understandable. He then explained that one possibility they are exploring in their alternatives is space near the Con Ed plant next to Stuyvesant Town, which would still be near the community district’s service area. Unlike the Brookdale Campus, however, which will revert back to the city once Hunter College vacates the site, the Con Edison site is not city property. This means that to even consider building a garage on the site, the city would have to acquire the property from Con Edison first. Aside from this obstacle, Martin explained that the plan would involve relocating John J. Murphy Park up to space which is now surface parking for Con Edison. At that point, the space then becomes open to other uses and in an overlay, Martin showed that DSNY’s plans for the garage fit neatly on top of the space. The potential Con Edison space is actually longer than the Brookdale site, which would offer various opportunities. “The structure wouldn’t have to go up five stories like the building they’ve proposed,” Martin explained. Committee members and residents of the surrounding community are opposed to the garage at the Brookdale site primarily because of the potential garage’s proximity to a number of hospitals and healthcare facilities but traffic and noise are also a concern, and Stuyvesant Town resident and committee member Larry Scheyer noted that the latter would be a problem at the Con Edison site as well. When asked if DSNY had considered the Con Edison site for the garage, DSNY spokesperson Keith Mellis only said that the Environmental Impact Statement on the proposed garage would include a discussion of alternatives that Sanitation has investigated. Last week, East Side elected officials made a last ditch effort to the Bloomberg administration to see if the city would hold off on plans for the Brookdale Campus sanitation garage. Via letter, the politicians argued that while there is no plan in place for the parcels of property set aside for development on both sides of the intended garage site, the city has still been moving along in getting needed approvals to get the garage built. The many issues referred to are the concerns of residents at nearby Waterside Plaza, East Midtown Plaza and Kips Bay about impacts on air quality and increased traffic on nearby streets due to the expected steady steam of garbage trucks in and out of the garage as well as various safety issues related to the site itself. The fact that the street is in a flood zone was also cited by the community. It was following a land swap between the city and CUNY that the school’s Brookdale Campus, located on First Avenue between 25th and 26th Streets, was fated to become the site of a sanitation garage that will be built in 2020. 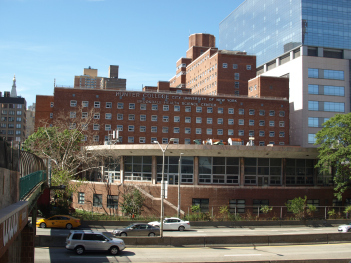 The deal is attached to a plan for a new hospital to be developed on the Upper East Side. However, the garage aspect has been consistently blasted by East Side residents and politicians. Along with the aforementioned reasons, many feel the surrounding neighborhood, better known as Bedpan Alley due to all the medical and science facilities, is simply not the appropriate location for a sanitation garage. Additionally, with the garage not expected to be ready for use until 2020, Hoylman, Kavanagh and Garodnick said there seemed to be no reason for the city to rush the plan along, other than the fact that Bloomberg will no longer be in office. Recently, the Department of Sanitation produced renderings of the garage, which it has presented to the Public Design Commission for preliminary review. When asked about the letter, Kathy Dawkins, a spokesperson for the department, told Town & Village that work on the project was not about to be put on hold. “The Department does not intend to consider slowing down the process until there is a determination on uses for the portion of the site not required by DSNY,” said Dawkins. As for the renderings of the garage, Dawkins said they weren’t available at this time since the designs are preliminary. “It is anticipated that the renderings will be available early next year,” she said. On the DSNY’s response to the letter, Kavanagh said he didn’t want to comment, though he did reiterate a point in the document to say the plan should include information about the non-garage space at Brookdale. For the first time in Stuyvesant Town’s history this past weekend, our children were prevented from sleigh riding on the “hill” safely because of the installation of a hideous bent metal fence and posts. The metal fence created an obstacle for kids to safely sleigh ride as they have done after every snow event for generations. Kids were attempting to sleigh ride and have fun while avoiding the perils of the metal fence and poles. In fact, the higher and more fun hill was just too dangerous so most kids and parents used the adjacent smaller and slower area. To top it off even the Oval was fenced off. I’m writing to you all because there is no one in management to address or contact concerning this very timely issue. As many of you know, the “hill” along 20th Street Loop and Oval as it known is the only “sleigh ride hill” within a radius of more than three miles of our community. Without any capital expenditure, or entrance fee or expensive “produced family event” our kids were able to just have fun in the snow. However, the current management is on a tear to fence off virtually every bit of space no matter how absurd the effect or benefit. Management has fenced off areas so small that the fences themselves comprise more area than the space it protects besides wasting money. It has even included a fenced off access to the Oval lawn Christmas tree (reserved for summer “practically no bathing suit” sunbathing) and a second fence around the new and not ready for prime time “Christmas” tree. So please use your collective access to see if you can contact anyone in management to “temporarily” remove these “temporary wire fences.” They can be removed quickly and reinstalled later if needed at all. In all fairness, I understand that leaf control was a partial reasons for metal fence policy. However, the many private park spaces have employed much less costly temporary natural material during late fall season, then removed it later. It has also been reported that fences were installed by management partly in response to complaints from tenants of pets ruining our flower garden areas. Perhaps a discussion could be organized to address these concerns and perceptions and resident pet owners’ concerns and not have our children suffer from a poorly thought out management policy. • Start by recognizing this longtime community activity and put in place temporary measures to support sleigh riding on the “hill” for our children. • Remove the wire fence and metal poles. • Install temporary safe barricades at the curb to protect sleigh riders like redeployed haystacks from Halloween events. • Create a temporary safe walking path adjacent to the “hill” for other residents. • Redeploy security personnel from standing inside the skating rink tent and post them outside in advance of the “hill” to protect kids and direct traffic. • Open up the Oval (early spring is plenty of time to restore grass for sunbathers). A longstanding community activity like “sleigh riding on the hill” supports an authentic and vital community. As a student of urban planning, community activities like these are a designer’s delight that planners, developers and architects work mightily to create. It’s what current management has failed to recognize here. Lastly, this management team’s effort to control and watch everything in this community only serves to undermine and ruin their efforts. Worse yet, the world knows a fence, a wall or “security” camera can never contain a genuine human activity. I would be happy to help in this effort and appreciate a tenant organization’s or others’ response.